Candlestick charts are an effective way of visualizing price movements and, due to the increased interest in the complex derivatives market, they are being used more and more widely. A combination of a line-chart and a bar-chart, where each bar represents the range of price movement over a given time interval, candlestick charts are most often used in technical analysis of equity and currency price patterns. 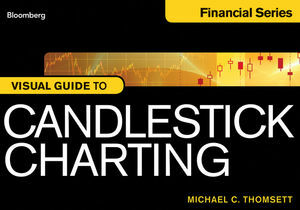 A guide to the most used charts, The Bloomberg Visual Guide to Candlestick Charting is arranged in an easy-to-use manner, providing a quick reference for those new to the field. Candlestick charts are formed with the help of the opening, high, low, and closing price of the day—if the opening price is above the closing price then a filled candlestick is drawn, and these charts are visual aids for decision making in forex, stock, commodities, and options trading. Enhanced eBook editions offer video tutorials, test-yourself quizzes, and full-color/interactive charts and graphs, available for purchase separately. A practical and concise resource for anyone new to this way of representing derivatives, The Bloomberg Visual Guide to Candlestick Charting presents sometimes confusing concepts in a format that is easy to understand and digest. Michael C. Thomsett is a financial writer with over sixty books and hundreds of articles to his credit, including the eight editions of Getting Started in Options, as well as Getting Started in Swing Trading, Getting Started in Fundamental Analysis, Getting Started in Property Flipping, and Getting Started in Rental Income. He has been a management consultant in the securities industries and is an active options trader.